Rear view of 1976 Bricklin SV-1 VIN 2895, with 1974 Suntan 4 speed VIN 322 in the background. Link Sites - These links leave this website, and may be of interest to the Bricklin Owner / Enthusiast. The Senior Editor / bricklin-sv-1-build-history.com is not responsible for the content on these links / other sites. Spend a brief 98 seconds of High Quality Time and see that democracy works because of religion. Clayton Christensen, a professor, at Harvard Business School, shares his experience observed by a Chinese economist. Bottom Line: Religion is critical to democracy. Tim Palmer makes outstanding model Bricklins !!! Thanks to Tim for a link on his site. 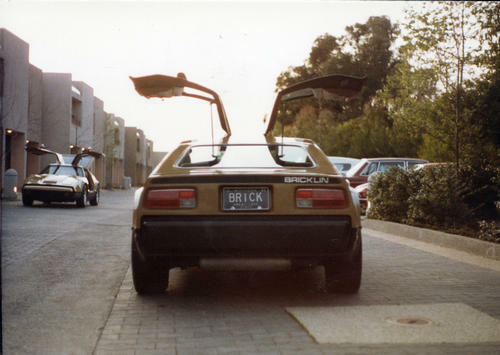 Hemmings Daily: Bricklin sells for 46 million on Moon Base 5 dated April 1, 2038 We have a bit of fiction here on the lighter side... Note the date: April 1, 2038. World's Tiniest V-12 Engine (Non Bricklin). Turn up the speakers, and spend 9 -10 minutes with a master at work !!! Superb !! !